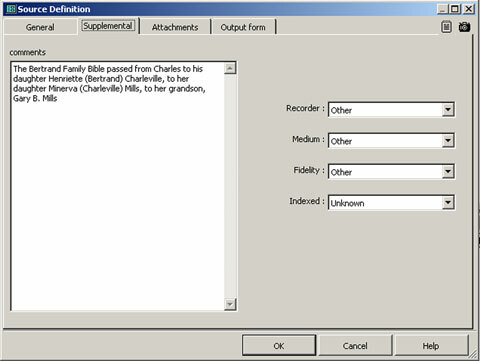 This example illustrates how a family Bible might be entered as a source. See the introduction for notes that apply to all three of these examples. 1. Family data, Charles Bertrand Family Bible, La Sainte Bible, new edition (Paris: Pourrat Frères, 1838); original owned in 1996 by Gary B. Mills (1732 Ridgedale Drive; Tuscaloosa, AL 35406). The Bertrand Family Bible passed from Charles to his daughter Henriette (Bertrand) Charleville, to her daughter Manerva (Charleville) Mills, to her grandson, Gary B. Mills. 1. Charles Bertrand Family Bible. 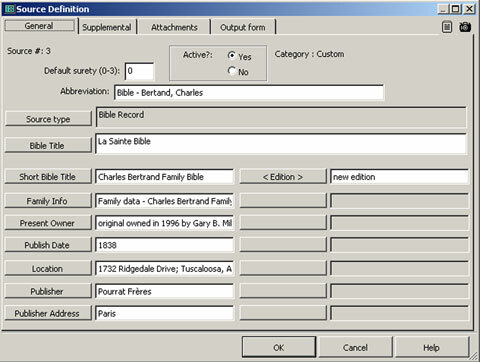 Bertrand, Charles, family data. In La Sainte Bible. New edition. Paris: Pourrat Frères, 1838. Original owned in 1996 by Gary B. Mills, 1732 Ridgedale Drive; Tuscaloosa, AL 35406-1942. [FAMILY INFO], [ITAL:][BIBLE TITLE][:ITAL]<, [EDITION]> ([PUBLISHER ADDRESS]: [PUBLISHER], [PUBLISH DATE]); [PRESENT OWNER], [LOCATION]<, [CD]><. Hereinafter cited as [SHORT BIBLE TITLE]>. [SHORT BIBLE TITLE]<, [CD]>. [FAMILY INFO]. [ITAL:][BIBLE TITLE][:ITAL]<, [EDITION]>. [PUBLISHER ADDRESS]: [PUBLISHER], [PUBLISH DATE]. [PRESENT OWNER], [LOCATION]. Family data - Charles Bertrand Family Bible, La Sainte Bible, new edition (Paris: Pourrat Frères, 1838); original owned in 1996 by Gary B. Mills, 1732 Ridgedale Drive; Tuscaloosa, AL 35406. Hereinafter cited as Charles Bertrand Family Bible. Charles Bertrand Family Bible. Family data - Charles Bertrand Family Bible. La Sainte Bible, new edition. Paris: Pourrat Frères, 1838. Original owned in 1996 by Gary B. Mills, 1732 Ridgedale Drive; Tuscaloosa, AL 35406. In her example, Ms. Mills reverses the order of the first two phrases in the primary citation and the bibliography, but TMG uses the same source element, Family Info, for both. I entered that information in the format she used for the bibliography. Solutions to this are to enter the data directly into the Output Templates for one of them, or to add another source element to split the two phrases, and adjust the Output Template accordingly. In her example Ms. Mills used a longer version of the provenance in the full footnote than she did in the bibliography. TMG's default Bible Record source type uses the same Present Owner source element for both, so I chose to enter the shorter version. A better solution might be to enter the longer version in the Comments field on the Supplemental tab of the Source Definition screen, as shown in the screenshot below, and modify the Output Template for the Full Footnote to use that. Long sections of text such as the provenance here often entered in the Comments source element.